2002 - 2006 Range Rover L322 3.0 TD6 Glow Plug Relay. Part Number: 2 246 919. We willALWAYS resolve your issue but would ask that you call us in order to do so. We are a bonefide 'End Of Life' Vehicle Dismantlers situated in East Devon. Land Rover Range Rover, Freelander & Discovery. MG All Models. 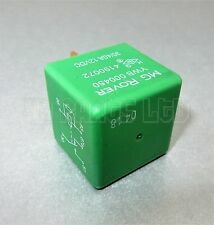 Genuine Rover5 PIN Green Relay (Multi-Use). Rover All Models. Made ByMG Rover. GenuineMG Rover Part. Rover flasher relay from rover 45 ywt10003. Red fuel pump relay. Rover MGF.MGTF. Checked before removal and OK. Other used Rover parts available. Part no.YWB 100790. (R7) 2 Pin Flasher relay, Lucas 8FL. There are two types available, (Lucas 8FL, Type 36. Squire type) and the (UP552, the round type). 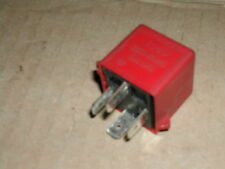 Genuine Lucas, Rover SD1 flasher relay, used but in full working condition. Lights on warning relay, Part no.A-EEP/0171. Land Rover Freelander 1. Checked before removal and OK. Other used Rover parts available. Yellow micro relay. Part no.YWB 10004. Checked before removal and OK. Other used Rover parts available. Multifunction yellow relay. Rover 600,1998. Checked before removal and OK. Other used Rover parts available. Rover 25,45. Checked before removal and OK. Other used Rover parts available. Part no.YWC103630. ROVER SD1 SERIES 1 WINDOW LIFT RELAY DRC2133. Long Since obsolete. (R4) Rover SD1 Lucas 5 pin Relay, Black cylindrical relay. british layland. 87A. Genuine Lucas, Rover SD1 relay, used but in full working condition. Located in the inner wing on the drivers side of the Rover SD1, just behind the battery. Flasher Unit, Part no. Checked before removal and OK. Other used Rover parts available. The item was checked before removal from vehicle and found to be in good working condition if a little dirty. This is a GENUINE ROVER NOS relay bracket as fitted to later cars at the factory. These are NLA. (R6) Rover SD1, 5 Pin relay, Lucas door window relay, 33375E, 28RA. Genuine Lucas, Rover SD1 window relay, used but in full working condition. Genuine PEKTRON relay, used but in full working condition. Yellow Relay,Part no. Rover 25,1999 on,1.4. Checked before removal and OK. Other used Rover parts available. Rover Part No. Air Conditioning Relay - we believe this will fit Rover 200/400 to 1995 models -. GENUINE ROVER ITEM. Google may be your best friend here! Rover MGF.MGTF. Checked before removal and OK. Other used Rover parts available. ROVER 600 series. AUTO ELECTRICAL RELAY - ref. This is a new and boxed genuine Rover part to fit the following vehicles This item is described as a power relay. Green Relay,Part no YWB10032. Rover 25,1999 on. Checked before removal and OK. Other used Rover parts available. Made By MG Rover. Genuine MG Rover Part. Land Rover Range Rover, Freelander & Discovery. MG All Models. Genuine Rover 4 PIN Yellow Relay (Multi-Use). Rover All Models. Colour: Yellow. Part Number YWB10041. Rover 800 Early & Rover 600 T series Turbo. UNIT 1 OLD HALL INDUSTRIAL ESTATE. The English Courts shall have jurisdiction to hear disputes between us. With a plethora of parts available on the shelf, we should have the part you require. Best of Rover Spares LTD. Prices remain in force until we publish new prices on our website. Austin Maestro. RELAY FOR AUSTIN ROVER. Austin Monetgo. New Genuine Rover Spare Parts. Relay for Rover K series engine. Air con relay. Part no.YWB100720. Rover 600,1998. Checked before removal and OK. Other used Rover parts available. In good used condition. Land Rover: Discovery MK1 MK2 TD300 and Range Rover P38 (1995 - 2002). Genuine Rover 5 PIN Green Relay (Multi-Use). GenuineRover or Land Rover Part. Rover: Almost All Models. CityRover Style (MK1 (RD110)) (ABS). This item is a used vehicle part and as such may have signs of general wear/handling. The table below contains further information. Item Information & Vehicle Details. Made By MG Rover. Genuine MG Rover Part. Land Rover Range Rover, Freelander & Discovery. MG All Models. Genuine Rover5 Pin Black Relay / Multi-Use Relay. Rover All Models. Colour: Black. For the RANGE ROVER EVOQUE. Engine warranties are only valid if new cam belts/idlers/tensioners are fitted prior to installation - proof will be required in the event of a claim. You must notify us within 48 hours of receiving the item so collection can be arranged. A Rover fog lamp relay in working condition. Came from a Rover 25. New and boxed. Genuine Rover part. CityRover Style (MK1 (RD110)) (ABS). Hazard Flasher Relay. Our Opening Hours are:-. 1405cc 84/63 8v. Engine Size. CASH ON COLLECTION. Vehicle Photographs & Guide. Land Rover: Discovery MK1 MK2 TD300 and Range Rover P38 (1995 - 2002). Genuine Rover or Land Rover Part. Rover: Almost All Models. Colour: Yellow. GENUINE AUSTIN ROVER HEATED REAR WINDOW RELAY. RELAY FOR MG / ROVER. Item : Relay, indicator. New Genuine Rover Spare Parts. 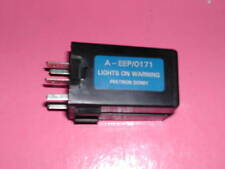 WIPER RELAY DRC8964. AUSTIN ROVER. (REF#J125). OTHER CONSIDERATIONS. ANY COMPATIBILITY GIVEN SHOULD BE USED AS A VERY GOOD GUIDE 'ONLY. '.